Although I went to the first Halloween party of the year on 25 August, I wanted to wait and write a post in case I had a chance to go to another party and get better pictures and videos. 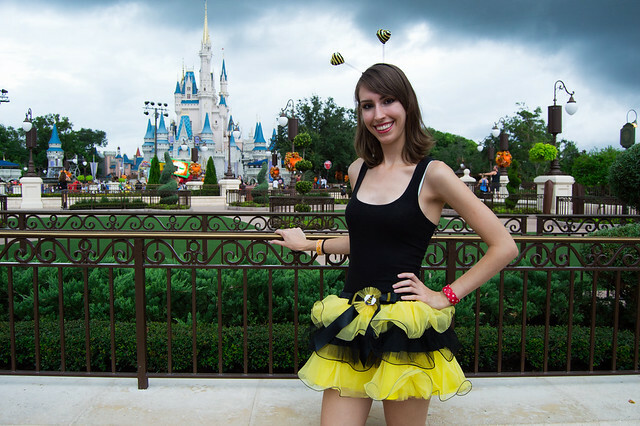 Maybe one year, I’ll have the time and money to attend more than one of Magic Kingdom’s Halloween parties, but 2017 was not that year! The party was on a Friday, so I rushed straight home after work and got dressed up in my bee costume. My initial plan was to make wings out of the pages of a dictionary so that I could be a Spelling Bee (thus combining my love of entomology and etymology), but needless to say, I never go to the trouble of making actual costumes, despite scheming all year. Nonetheless, I felt pretty cute with my antennae and tutu, and I was joined by my pal Josh, who went with a bat theme for his attire. We got to Magic Kingdom shortly before the party started, but the party entrance was already set up, so we were sent that way to collect our treat bag and our first handful of treats (or in our case, tokens, which we could then exchange for vegan treats at one of the 2 allergy-friendly candy stations). 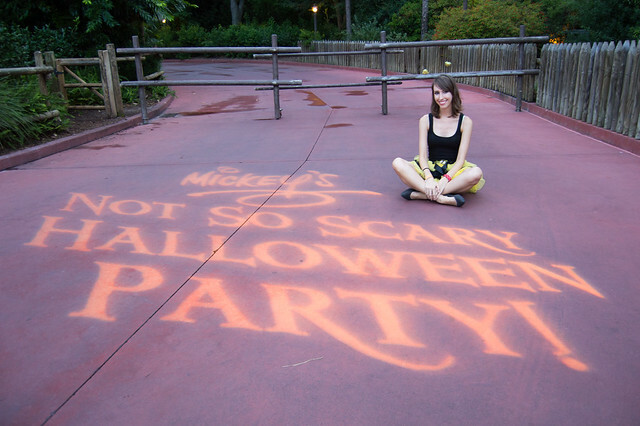 Although a lot of people come to the party and prioritize getting their photos taken with the characters that aren’t out at other times of the year (such as the 7 dwarfs, or The Nightmare Before Christmas‘ Jack and Sally), waiting in line for those photo ops is never worth it to me. There are plenty of chances to take pictures that don’t involve a 60-minute (or longer!) wait time. 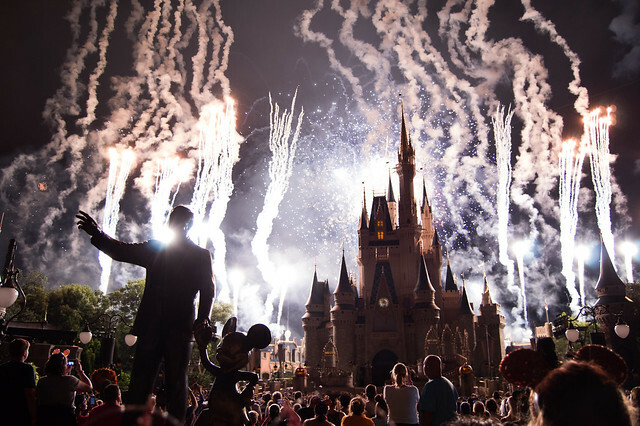 Big thanks to the PhotoPass photographers who took the above 3 pictures! Before the first showing of the Boo To You parade, we caught the first performance of the Hocus Pocus Spelltacular stage show. 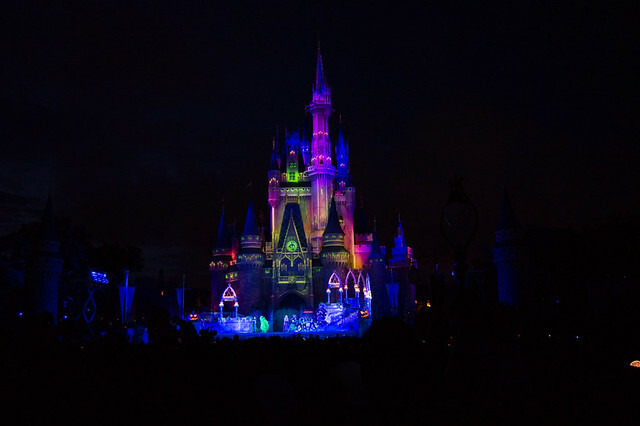 Even though I’ve never really liked the movie Hocus Pocus, I fell in love with this show the first time I saw it on that 2015 visit because of the villains it incorporated, especially Shadow Man from Princess and the Frog. This year, I felt like Hades and his dancing really stole the show. After the show, we found a place to watch the Boo To You parade. It was soooo exciting as the music started to play over the speakers and we craned our necks to get a look at the parade as it approached. 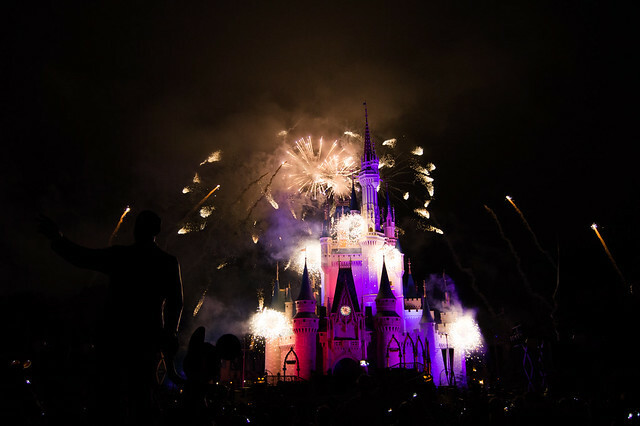 Following the parade, we found a place just behind the Walt and Mickey Partners statue to watch the HalloWishes fireworks. 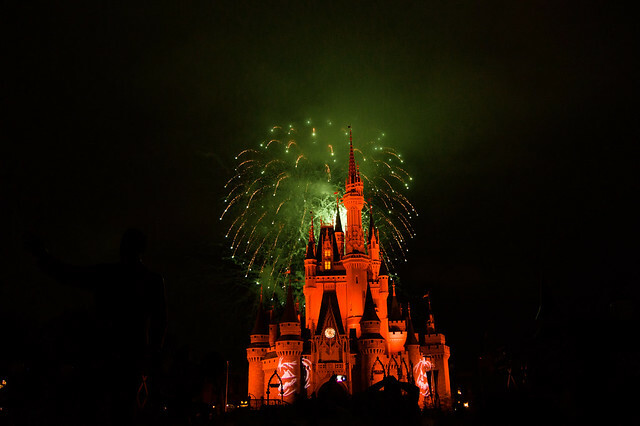 Even though they don’t compare to the regular nightly firework/projection show that Magic Kingdom has, I love the soundtrack of Halloween music that plays during these fireworks. 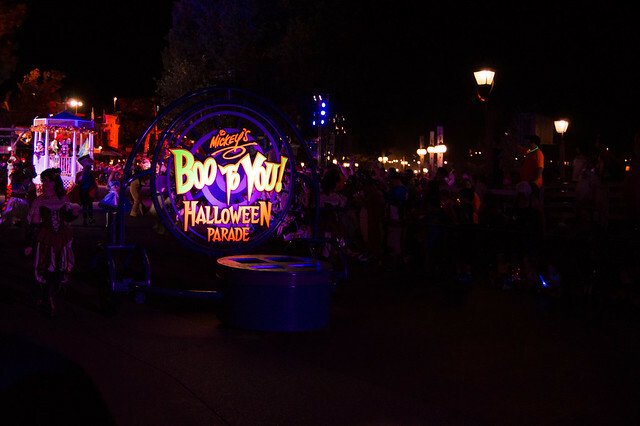 The second performance of the Hocus Pocus show was cancelled a few minutes after starting because of the rain, and the second run of the Boo To You parade was delayed until the rain stopped. When the parade finally did start, the performers didn’t do their usual choreography because of the wet ground, but it was still fun as they creepily passed by, and the lighting in the spot where we stood this time was a lot better. 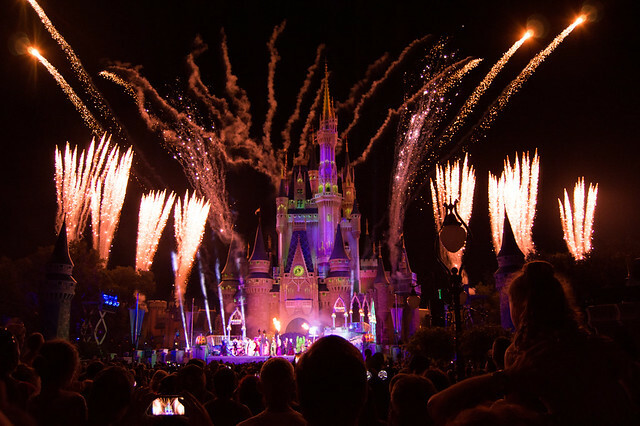 Finally, the last Hocus Pocus stage show began at midnight. The spot where I watched from was very close to the front, so I had a great view, and I soaked it in as much as possible, hoping I’d be able to come back and see it again this year but knowing I might not be able to. After the show, the party was over, and we left with our bags of candy that we had managed to collect between all the shows/parades that we watched. I have to admit that living 10 minutes from the parks has caused some of the wonder to wear off. 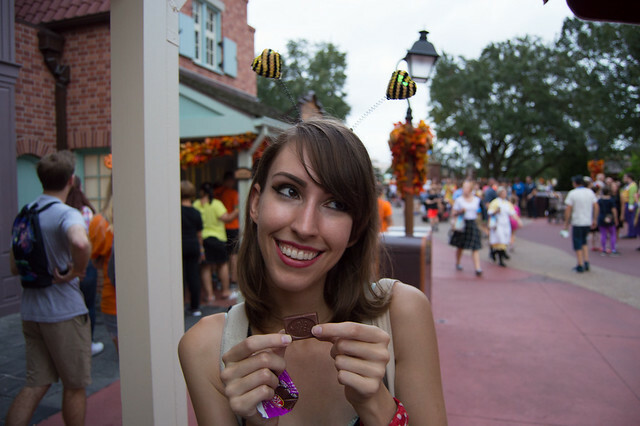 However, there are certain things that still bring me so much fresh enthusiasm for Disney, and the Halloween party remains one of those things, even after attending for the 3rd year in a row. The first year that I went to the party, I only took one selfie. Last year, I took a lot more pictures and some snapchat videos, but they were all on my phone and pretty low quality. This year, I brought my camera, and I took photos and video. So it’s exciting that I have all of these ways to look back at one of my favorite events of the year. I hope that my night photography skills improve even more so that 2018’s Halloween party mementos are even better! I’m just learning how to edit videos, so I know this isn’t a masterpiece by any means, but it makes me happy to watch some of the moments from my favorite parts of the night, and I thought I’d share for anybody who wants to skip through and see what the stage show, fireworks, or parade are like.